Of these, Saint Isaacius is celebrated also on May 30. He became a monk at an early age and was a worker of every virtue; a zealot for the Orthodox Faith, he was also deemed worthy of the gift of prophecy. The Saint dwelt in a small hut near Constantinople. When Valens the Arian marched against the Goths, who were at the Danube River, this righteous one went out himself to meet the Emperor and, taking in hand the reins of the Emperor's horse, said to him with boldness that God had incited the barbarians to come against him, since he himself had incited many to speak against God in blasphemy, and had driven God's true worshippers out of the divine houses of prayer. Furthermore, he told him, if he ceased fighting against God by means of heresy and returned the good shepherds (that is, the Orthodox bishops) to the flock of Christ, he would easily gain the victory over his enemies. However, if he did not desist from these things, nor have God as his ally, at the very outset of the battle both he and his army would certainly be destroyed. "Learn from experience," he said, "that it is hard to kick against the pricks. Thou shalt not return, and this expedition will be destroyed." But the Emperor became angry and had the righteous one locked in prison that he might punish him and put him to death on his return after he conquered the barbarians. But he was utterly defeated and was burned alive in a certain village in the year 378 (Theodoret of Cyrrhus, Eccl. Hist., ch. 4: 31-32). When his surviving soldiers returned from the war, wishing to tempt the Saint, they came to him and said, "Prepare to make thy defense before the Emperor, who is coming to fulfil what he spoke against thee." But the Saint answered, "It has already been seven days that I smelled the stink of his bones, which were burned in the fire." Thus the righteous one was released from prison. 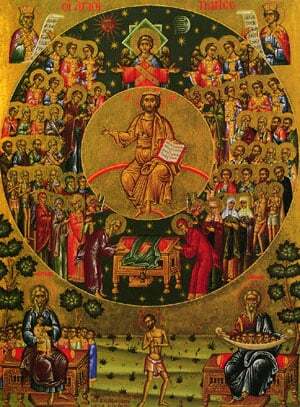 All marveled because of his prophecy, and he became even more wondrous by means of the zeal he displayed in behalf of Orthodoxy in 381, when the Second Ecumenical Council was convoked. After this, a monastery was built in Constantinople for him, and he piously shepherded those struggling with him in asceticism. Having served as an example of the monastic life for them, he reposed in peace about the end of the fourth century, leaving Dalmatus as his successor. As for Saint Dalmatus, he was at first a soldier in the second division of the soldiers known as the Scholarii. Later, however, he forsook all things and taking his son Faustus, went to the above-mentioned monastery of Saint Isaacius, where he donned the monastic habit. Through his virtue he became venerable in the sight of all. He was present at the Third Ecumenical Council that was convoked in Ephesus in 431, and there displayed his zeal for Orthodoxy against Nestorius. The Council elected him Archimandrite of the monasteries in Constantinopie. Having lived for more than eighty years, he reposed in the Lord. With hymns let us extol Isaacius, Dalmatus, and Faustus as Christ's servants, who shone forth brilliantly in asceticism in the world, and overturned the heresies by faith; for they cry out in behalf of us all. Share the feast of Isaacius, Dalmatus, & Faustus, Ascetics of the Dalmation Monastery with an icon greeting ecard.